I bet couple number 1 won with a landslide! :) anyhow, we're glad you've voted. thank you very much!! hugs & kisses! Now it's time for choosing my make up artist. 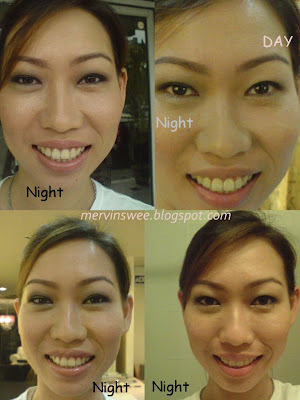 After my previous blog about how to choose a make up artist , which is.. i dunno how at that time, but after 3 trials!! I think i can tell you my opinion now..
1st! you must like her face, because she's gonna stand real close! 2nd! you must also like her as a friend, because you have to trust her to make you look pretty! 3rd! she knows what she is doing, she's the professional, so we don't tell them what to do, rite? but then leh, she should be able to accept feedbacks. 5th! doesn't criticize your face/ skin / eyes/ hair... that's why we hire them, to make us look pretty!! and to tell us we are pretty. hahahaha! 8th! is good with styling hair too! feedbacks from my friends are love the smokey eyes, lip color not so suitable, foundation a bit cakey n made my face lumpy, for some reason, my eye bags looks more obvious, oh and i look tan? she kept on rubbing my eye bags with cotton bud to clean the black eye shadow, that i think it made my eyes a bit sore, i had to ask her what about my lips, and then she only put lipstick on for me, not so attentive to me, because i ask her, the black eye shadow on my face, you would clean that right on actual day, then she asked me, where? and took cotton bud and clean it. and i walked out with the hair clip she clipped on my hair. i like her day make up though. But you only can see ONE EYE of the day make up. actual day 2 sessions in one day is rm800 inclusive of fake lashes and ampoule and simple hair accessories. Feedback from friends, eyes a bit fierce, and makes my eyes far apart. Hair is messy. Hair looks sophisticated. Lip color is nice and natural. 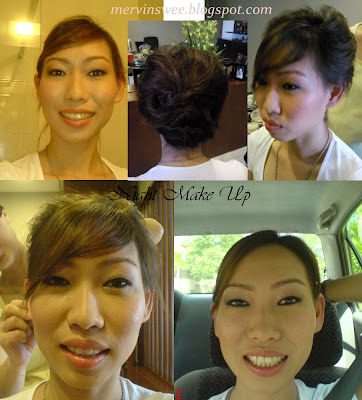 Cost: Rm100 trial - hair and make up. approx. 1 1/2 hr. feedback from friends, eyes looks puffy, lime green isn't my colour. Cost: trial RM50, make up only, have to drive to her house in Ampang. So do you think the saying, 'yat fan chin yat fan fo' in cantonese, or if you pay peanuts you'll get monkeys? can be used for make up artist? Don't bother paying full amount for deposit. We didn't the 1st time with Bangi EQ, and lucky for that, they promised that they would refund our deposit in 2-3 weeks time, and this is the 4th week, and still no $$ in our bank account. 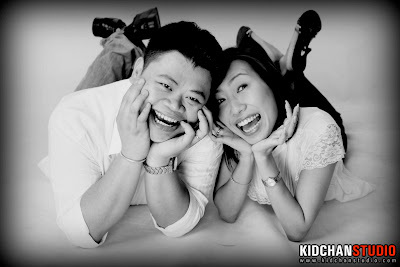 The black and white, says RM5,000 deposit, we told them we will pay RM2,500 and in December we will pay the other half, but when December came, they didn't bother to follow up with us, So of course, we rather keep our money in our bank account rightt.. So tip number 268, Don't have to pay full amount of deposit!! :) The skill is, negotiate negotiate negotiate! been searching for hotels for my friends in chiangmai. It's not easy as we want budget, clean, good location, near river (for loykratong festival), near night bazaar.. But here's a list of people voted for us.. so far..
you wanna know who is running my so called campaign?? Yah right, in your dreams sweefong. So Simple!! Closing date is March 12 2009!